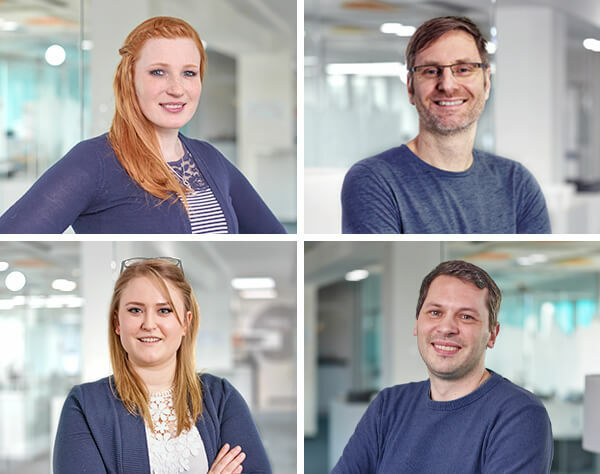 House of Tents - the tent experts! 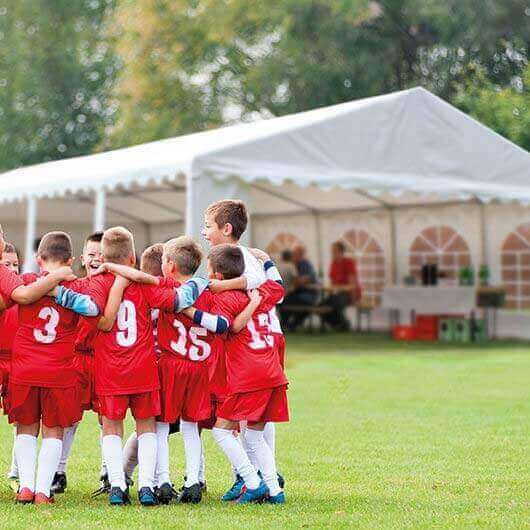 House Of Tents has a vast selection of marquees on offer: from affordable PE tents to extra-high, fire-resistant-certified PVC tents with statics. At House Of Tents, marquees are waterproof, UV resistant and feature walls sections that enable air quality to be regulated as standard. They allow an even flow of fresh air, without the tent becoming too cool or creating any draughts. Both the gable walls and side wall sections can be flexibly installed. This results in a multitude of possibilities for the entrances. The frames of our marquees are made of fully galvanised, anti-corrosive steel. We recommend our robust marquees for long-term use. Depending on the product line, these are additionally equipped with a base frame and multiple roof reinforcement. With a garden pavilion from House of Tents, you can enjoy your own garden in almost any weather. 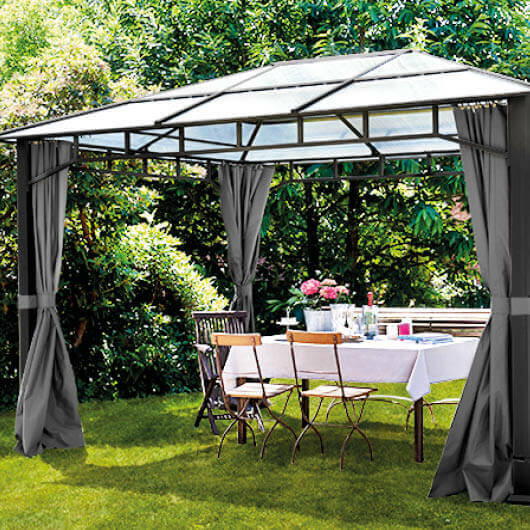 For a relaxing breakfast on the patio, a spontaneous barbecue or a garden party with friends and family, a Garden Pavilion by House of Tents offers reliable protection. A high UV protection factor protects against too much sun. A guaranteed 100% waterproof roof keeps everything dry even in the rain. Decorative side panels, which close quickly in cool evening air or on windy days, bring a cozy indoor climate. House of Tents offers the right garden pavilion for different requirements. Construction materials such as steel or aluminum, different post thicknesses, roofs made of waterproof high-performance polyester or durable polycarbonate sheets enrich our product range. And best of all ... House of Tents garden pavilions are particularly simple and quick to set up without any additional tools. Convince yourself! House Of Tents gazebos provide optimal shelter from direct sunlight and bad weather. We have a large variety of gazebos: from solid products made of steel and high-performance polyester to extra-robust gazebos with an aluminium frame and PVC tarpaulin. For fast, simple assembly, gazebos at House Of Tents feature a practical scissor mechanism and high-quality click system. The gazebos are available with or without wall sections. Three types of wall sections are available: with arched windows, with square windows and without windows. All models come with a practical carry bag. Our gazebos combine great mobility with optimum protection from the weather. They can be quickly assembled and require little space for storage. 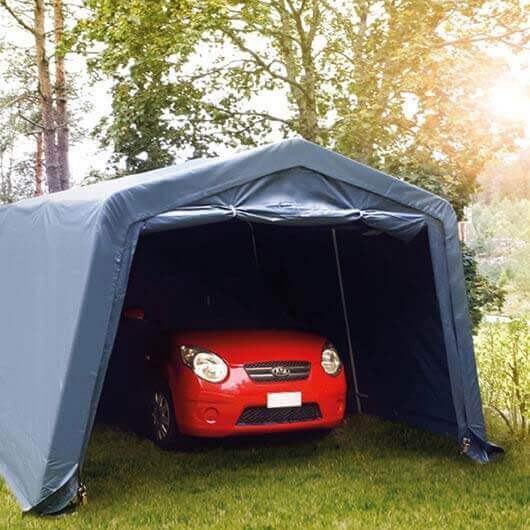 At House Of Tents, we have a large selection of portable garages for motorbikes and cars, as well as for caravans, lorries and boats. The similarities between our portable garages: In order to provide more stability and a high level of weather resistance, a seamless roof and wall section is featured, which is precisely secured to the steel construction by a special rope system. This prevents water from collecting on the roof, as well as reducing movement of the tarpaulin due to wind. The frame is made of fully galvanised, anti-corrosive steel as standard. The tarpaulins are 100% waterproof and provide high UV protection. The entrance gate features a zip for quick opening and closing. The portable garages differ in quality in terms of material and level of stability - some portable garages come with statics. Storage tents provide fast, stable space protected from the weather and mobile use - unlike permanent building structures. At House Of Tents, storage tents in different sizes, forms and qualities are available. All storage tents are suitable for year-- round use and feature an extremely stable and sturdy frame construction. Storage tent frames are made of fully galvanised, anti-corrosive steel. They feature robust, durable PVC tarpaulins in different qualities. Storage tent tarpaulins are 100% waterproof, provide high UV protection and are resilient against environmental influences. 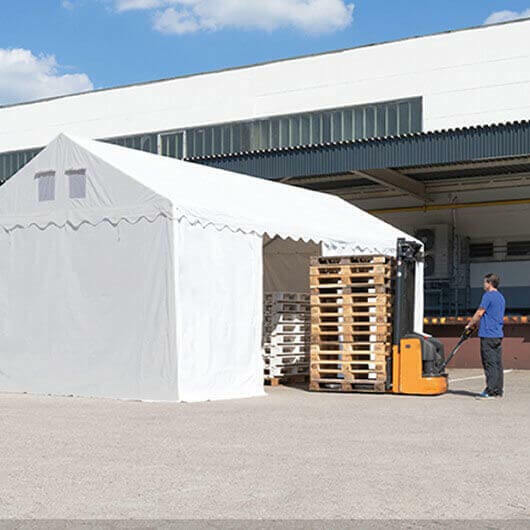 Due to the robust and durable qualities of storage tents, they are outstanding alternatives to permanent building structures. 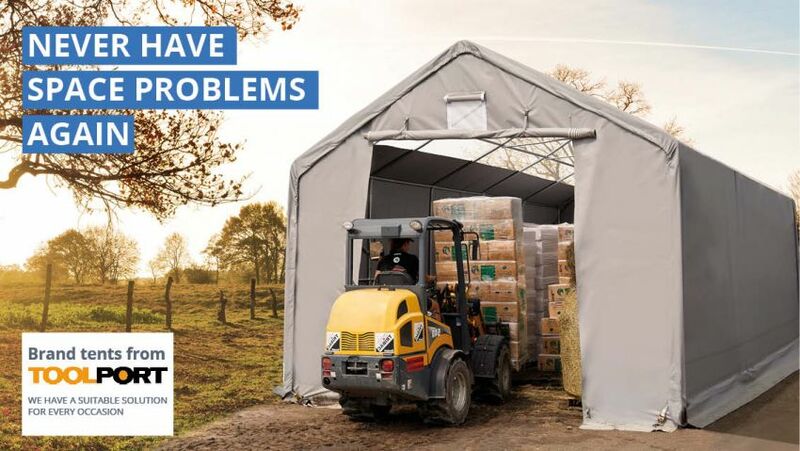 With an arched storage tent, protected storage space for goods and vehicles can be created in no time. 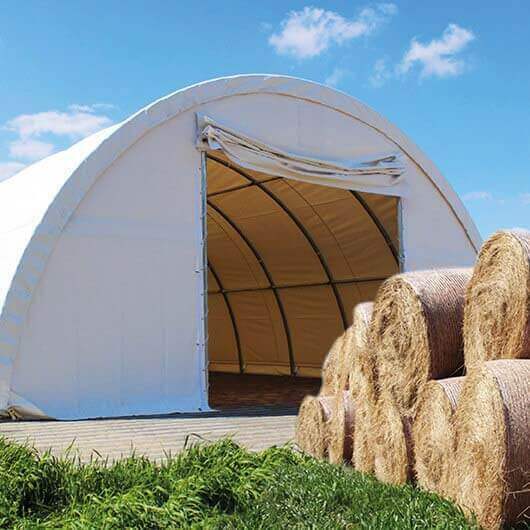 Arched storage tents come with statics, are extremely load-bearing and can be used all year round. The exact values regarding load capacities can be found in the applicable product descriptions or in the accompanying statics manual. 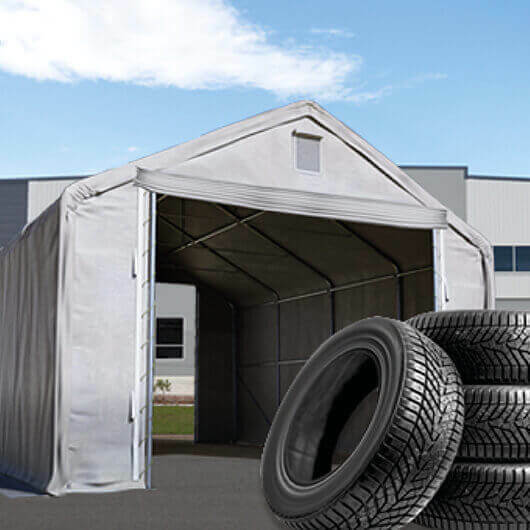 In addition to the stable, anti-corrosive frame, arched storage tents feature a strong, 720 g/m² moulded PVC tarpaulin. This is one of the highest quality and most stable PVC tarpaulins on the market and are UV resistant and 100% waterproof. In addition to entrances, the gable sections of the arched storage tent feature additionally built-in ventilation windows, ensuring optimum air circulation and an excellent climate inside of the tent. The entire tent construction was certified by German engineers. 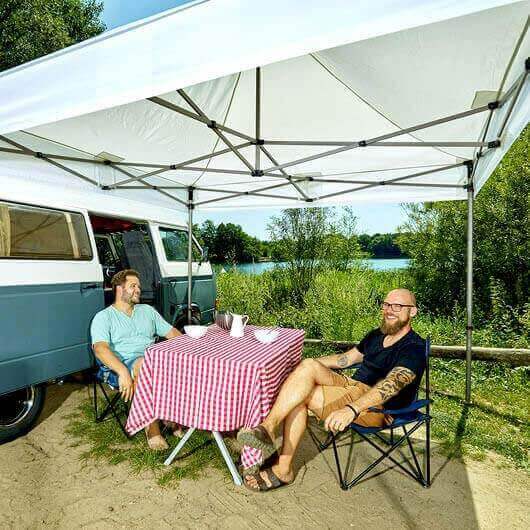 At House Of Tents, a variety of tent accessories is available. Personalise your tent with new entrances, partition walls or gable sections. The Arabian entrance, for example, creates a sheltered open area in front of the tent – perfect for those smoking or getting some fresh air. Gable walls with windows ensure a light, more open atmosphere. Connecting gutters connect two tents together, ensuring a seamless, sheltered passage between the two tents. Optimisation of stability is of great importance. Ground attachments and storm protection prepare your tent for wind and bad weather. Moreover, for maintenance and repair, special cleaner and repair sets for your tent are available at House Of Tents. If required, we also provide replacement parts. We have approximately 100,000 replacement parts available and in stock.